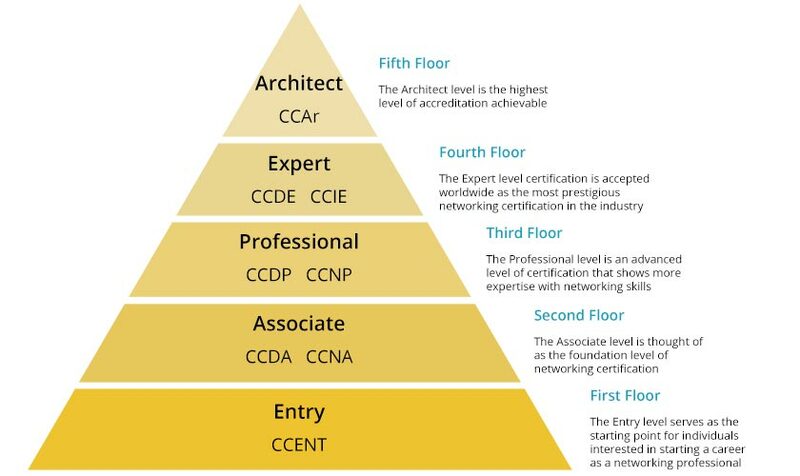 Most people get started with routing and switching, so they get their CCENT (Cisco Certified Entry Networking Technician) certification and then progress along what we would call the pyramid of Cisco certification. The height on the pyramid dictates how deep into that focus area you want to go. So if you want to know how to get started with Cisco certification; first off pick your area of focus. 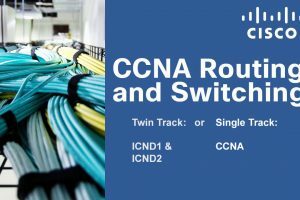 And we would highly suggest routing and switching, if you’re not too sure where to start because routing and switching applies to just about every certification track that Cisco has on offer. Then start at the entry level, which for the routing and switching path happens to be ICND1. That is the first exam that you will take and when you pass that, you get the CCENT which is the Cisco Certified Entry Networking Technician certification that you have achieved. Go on and pass ICND2 and now you have the Cisco Certified Network Associate (CCNA). Congratulations! you have achieved the associate level certification with Cisco. 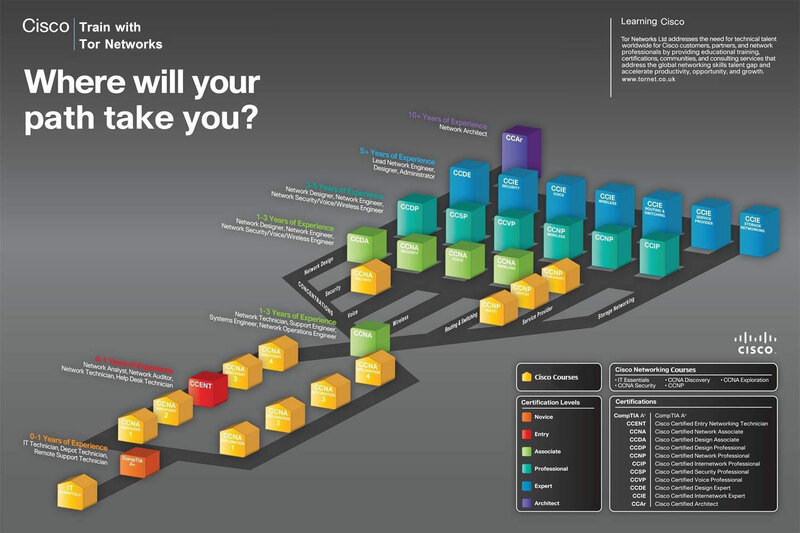 This image represents all the different levels that you could achieve in the Cisco certification world. Now pass three more exams Route, Switch and T-Shoot and you have achieved the Cisco Certified Network Professional certification. Each one of these putting you into a new class of network engineers. And each one of them opening new doors of employment. Also each one of them opening new opportunities of tasks you can perform, concepts you understand, superpowers that you have. The speed at which you move up this pyramid is totally and one hundred percent dependent on you; and how much money you have. Each one of these exams that you take cost anywhere from a hundred dollars all the way up to $1,500. If you’re up there at the architect level you actually have to travel out to Cisco’s headquarters and take a proctored exam in their environment. You should be ready before you go take one of those exams or else you just start wasting money. Each one of these exams has a three-year shelf life so, when you pass the ICND1 you now have the CCENT (Cisco Certified Entry Networking Technician) certification which lasts for three years. When this three years’ period comes to expiration you have three options you could use. One you could just let it expire and you lose the certification, then you must start over if you want to keep your certification status. At that point you can retake the exam you already took; retake ICND1 and you will be granted another three years. After you pass the ICND1 certification exam you regain the CCENT certification at that point we would highly suggest to move on to the higher levels. Cisco also encourages certification growth so as soon as you pass the ICND2 exam you automatically get this one and the CCNA certification for the next three years. You would automatically renew your lower level exams for three years as well. If you move up and take the CCNP exams and there are three (Route, Switch and T-SHOOT). Let us say you have only passed one of the member exams ROUTE. Cisco sees this as you continuing your certification journey, so you not only pass that specific exam but they also automatically renew all your lower level certifications for three years. That’s awesome because you don’t have to spend your time re-taking stuff you already know. You can continue to grow your knowledge into SWITCH and T-SHOOT. As soon as you pass these you’ve got the CCNP. Three years are assigned to each one of those exams. It’s not cumulative, it’s not like you’re adding time, you get a three-year refresh and everything starts ticking down from there. You can’t add up your three-year intervals to get nine years of certification. Let us fall back to the various areas of certification path because these really represent your career path in the Cisco certification world. Most people will specialise in one or two, maybe even three of these areas. For example one can begin with Routing and Switching and then might progress to achieve a professional level CCNP certification. And if they are at that stage they might develop interest in the wireless field, and maybe decide to get an associate level CCNA certification in wireless. If security really peaked your interest while you’re doing your associate level certification, and want to go all the way so you achieve the professional level CCNP and then expert level CCIE Security. That is usually where you will stay. You might think that it is aligning with your career goals. That’s what you do to gain and keep those certifications up-to-date. Occasionally, you’ll find people who hold 5 CCIE’s in all different areas. These are usually people who are paid educators or paid consultants. Their whole job usually is just to learn information, and disseminate it to others. It is not normal to see this kind of level of expertise. One thing is guaranteed change is inevitable! It’s a quote from the movie Matrix! For example, Cisco used to have CCNP Voice which you don’t see here in this list anymore, because about three years ago, CCNP Voice went away and was replaced by CCNP Collaboration. Because now Voice and Video exams became Collaboration. So Cisco provided a migration path so existing certification holders could migrate skills from CCNP VOICE or CCNP Video into CCNP Collaboration. 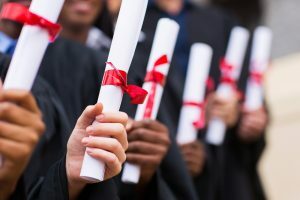 Now just in having this discussion here on the areas of focus, we have inadvertently outlined the top four certification programs that Cisco has on offer today. Simply because of their broad appeal to network environments everybody needs routing and switching, wireless and security, and most people need voice and video collaboration on their network environment. So, if you are looking for job appeal, those are the tracks that you want to go on. You also notice that the Routing & Switching, Wireless, Security and Collaboration certification tracks begin with the same exam CCENT. ICND1 is the exam that gets you started on all four of these. And then you take a specialized CCNA for each one. In short CCNA Routing and Switching builds on the original ICND1. CCNA Security builds on the original ICND1. One common exam, one unique exam to get your associate level certification for those four paths. We are not saying these other certification tracks aren’t important. It is just they’re a little more specialized; not everybody works for a service provider, not everybody lives in an industrial environment. Typically, those who current work or want to work in those environments will follow those certification programs. One may say that experience is king and we fully agree that experience has no alternative. If you’ve got 20 years of experience, you not only gain the practical knowledge but you also gain the relationships that will open doors all over the place. And at that point no one cares what certifications or degrees you have. What we are talking about is how you get there in the first place. or if you’re bored in one of the technologies that you are currently doing how do you get started into something new. That is where those tracks can help you out. What position can I get into with a CCNA? The number of possibilities is very huge however remember CCNA is a door-opener! It opens positions to you that you may not have even been considered before. And a lot of times they will be get your foot in the door and then grow in that organisation. You might be an installer for a consulting firm, where you get the CCIE level engineers writing the configurations for all these devices that you can take and install and implement on client networks, and button up all the things that don’t quite work. And you gain just a ton of experience doing that. Or maybe you start as a junior network engineer at a group of schools where you go around to different schools and implement content filtering at their firewalls and change VLAN assignments. All this is a door opener that gives you the experience you need where you say I would like to assist that’s really where the associate level, comes in. You can say I would like to assist in maintaining this or I have some other experience and maybe server administration and I can also support the network. And that’s where the CCNA is the core of the Cisco certification.